With export revenue for Vietnamese footwear and handbags hitting nearly $4.1 billion in 2015, the US is likely to surpass the EU to become the largest import market of Vietnamese footwear products, as more local shoemakers are scaling up their production ahead of the Trans-Pacific Partnership. Nguyen Chi Trung, director of Gia Dinh Shoes, is bullish on footwear exports to the US. “I have never seen so many US importers seeking competent Vietnamese manufacturers in the footwear, handbag, and umbrella sectors. The pace of export to the US market has been increasing since mid-2014, with more importers choosing Vietnam rather than China in preparation for the Trans-Pacific Partnership (TPP). The US is also the most important market for Gia Dinh Shoes, as it makes up 55 per cent of the company’s export turnover, which is somewhere between $45 million and $50 million,” he said. An Lac Footwear also confirmed that their exports to the US market soared 20 per cent from 2014-2015, prior to the conclusion of the TPP. Reputable Vietnamese shoemakers are highly valued by US importers, indicated by the increasing shift of footwear orders from other markets to Vietnam over the past two years. It is only a matter of time before the US surpasses the EU to become the largest import market for Vietnamese footwear products. Statistics released by the Ministry of Industry and Trade (MoIT) show that exports of Vietnam’s footwear products to the US hit $1.91 billion in 2011, $2.25 billion in 2012, $2.63 billion in 2013, and $3.33 billion in 2014. This figure was nearly $4.1 billion in 2015. “Compared to 2014, the value of Vietnamese leather and footwear exports to the US market increased by $750 million, with a growth rate of 20 per cent,” said Nguyen Duc Thuan, chairman of the Vietnam Leather, Footwear, and Handbag Association (Lefaso). According to Lefaso, Vietnam is the fourth largest footwear producer worldwide, after China, India, and Brazil, as well as being the third country (after China and Italy) in terms of value. Vietnamese footwear is exported to 50 markets worldwide, standing in second position after China with regards to market share in the US, EU, and Japanese markets. According to the Footwear Distributors and Retailers of America (FDRA), Vietnam’s potential for a competitive footwear industry is promising, with a growing trend of US importers eyeing the sector. More firms are ramping up their investments in Vietnam’s leather and footwear industry to increase exports in anticipation of the coming into force of the TPP agreement in 2018. Vinh Phuc-based Lap Thach Shoes has increased its exports to the US for the past three years by expanding its facility. “The Vietnamese footwear industry will enjoy zero import duties in the US when the TPP takes effect. Tariffs on some products to the US will be reduced over a period of three to five years, which is driving us to increase our capacity,” said Tran Quang Khai, the firm’s director. Khai added that the US market holds excellent opportunities for domestic shoemakers to expand into. This potential market is also less risky than the EU in terms of protecting their domestic industries as approximately 90 per cent of all shoes sold in the US are imported. Another shoe manufacturer, Binh Duong-based TBS Group, inaugurated a new factory in 2014. The first phase of the shoe manufacturing facility in Kien Giang with total investment capital of $54 million was put into operation last year. Meanwhile, the bag manufacturing factory is operating at maximum capacity to complete orders for brands like Coach, Decathlon, Vera Bradley, Tory Burch, and Titleist. Lefaso also said that the domestic leather and footwear industry is attracting more orders due to the positive impacts of the TPP and the large capacity of the sector. Vietnamese shoemakers are already experienced in doing business with US partners, which helps them take advantage of opportunities arising from the trade pact. Some companies with large-scale production and closed supply chains will have more of a chance to increase their exports, such as Dong Hung Group and Taiwan’s Pouchen Vietnam and Pousung Vietnam. Lefaso estimates that total footwear export turnover to the US will be $5 billion by the end of this year. Meanwhile, Vietnam’s market share in the US is forecast to climb to 12 per cent in 2018. However, 55 per cent of raw materials and inputs are imported from other markets, mainly from China. 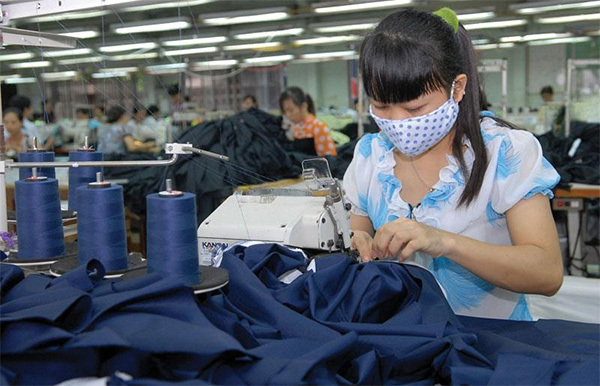 This dependence will hinder Vietnam from enjoying tariff reductions when the TPP takes effect. Thuan from Lefaso stressed that domestic shoe manufacturers with a high rate of locally-sourced input materials will have their tariffs reduced, thereby increasing exports to the US and driving their production. The US demand for shoes and handbags is diverse, with less brand loyalty than the Korean and Japanese markets. This, coupled with large orders from US investors, creates favorable conditions for Vietnamese shoemakers to organise production, save costs, and increase investment in equipment for each product. Dao Tran Nhan, minister counsellor and head of the trade office at the Vietnamese Embassy in the US, said that domestic firms should invest more in high-end and self-designed products that can yield more value-added benefits than outsourcing, and which would help build credibility with US consumers. Local firms should also pay attention to the production process and adhere to international standards for corporate social responsibility, such as SA8000.